Yellowfin is a business intelligence software that aims to expedite the process of getting actionable insights and data-driven predictions from your company’s performance. While it can be used to identify the results of your operational activities, this single-integrated analytics platform takes a step further by giving you in-depth explanations on why you got these results. By doing so, it is easier for you to get deeper insights into your data and maximize that information by making smarter business decisions. As an end-to-end analytics solution, Yellowfin delivers a complete BI stack by separating a product for analytics and another for data transformation. Its suite of solutions also includes market-leading collaboration tools and automated insights. With its fully-integrated, web-based ETL and visual-data preparation tools, you can immediately dispatch data for analysis. Users can choose between directly connecting with data sources including plugging in data science models or building your own connectivity to transform data into meaningful insights. Moreover, storytelling is incorporated within the application so you can get full-interactive data. Yellowfin also has analytic apps to empower you in creating flexible reports and dashboards. In wrapping up the process, the software also offers collaboration and sharing tools so you can easily and quickly share insights with the right people at the right time. Throughout all stages of your analytics journey, you are assured of a governed and secure analytics platform for your data processing. To top it all off, Yellowfin has an enterprise governance feature that allows you to deploy curated analytics across your organization. It comes with fine-grained security tools that let you create intuitive approval workflows that cater to the unique needs of your operations. Yellowfin makes use of a complete BI stack that can help you with multiple data analytics problems. Whether you need data transformation, automated insights, or collaboration tools, this software will provide you with the tools you need. It even comes equipped with robust enterprise governance features that let you use your BI in line with fine-grained security. With this, it is easier to create detailed approval workflows that let you deploy trustworthy data across the organization. One of the key characteristics of the Yellowfin software is that it is a single integrated platform. This allows users to deploy it on-premise or in the cloud–whichever is more convenient for your organization. With this, you can leverage the software’s business intelligence tools that match your deployment setup, ensuring user adoption across your organization. 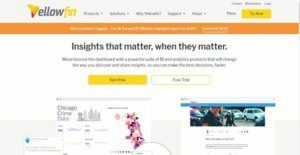 Yellowfin offers Storyboard, a fully-integrated presentation module, to tell compelling stories and relay the importance of your data insights. It lets you easily share powerful presentations, combine live and interactive reports, and use custom text, images, and videos. It is also designed for mobile delivery enabling you to share your presentations on the go. Commenting and bookmarking content is also allowed to enable a more collaborative and interactive element to the presentation. There are many ways to present and digest data. This is why Yellowfin is built to support all types of dashboards: analytical, operational and strategic. Analytical dashboards simplify data exploration for anyone; they are highly interactive and link all data together. Operational dashboards empower independent users to access and understand personalized information in real-time. Meanwhile, strategic dashboards show you various data sources with high-level summary reports and KPIs so you can easily monitor what’s important. Finding out how to make use of your company’s data is a crucial aspect in any industry. To help you out, Yellowfin provides automated assistance through the combination of human insight and machine learning. If you need to find an answer, you don’t have to dig through your data, searching to find the appropriate insight. Instead, all you have to do is ask the question and the system looks for the data for analysis, runs a series of steps to find the most statistically-relevant result, and presents it in an easy-to-understand visualization and narratives. With no coding required, you can easily visualize and explore data with the software’s advanced visualization. It has over 50 chart types such as trellis charts, infographics, and GIS maps, to help you understand your business in the right perspective. Data discovery also assists you in exploring and discovering valuable insights as well as spotting trends, patterns, and outliers. What Problems Will Yellowfin Solve? Yellowfin offers various BI solutions on a single platform to eliminate the need for using multiple BI systems to address each BI problem in your organization. You can consolidate your top-down traditional reporting, bottom-up data discovery, and embed analytics capabilities from one platform. This means you don’t have to separate data into various analytic silos. Some of its top solutions include assisted insights, dashboards, data visualization, data storytelling, data sources, data preparation, governance, and data transformation, among others. Yellowfin allows you to tell a story and lets your data do the talking. Instead of copy-pasting a screenshot of charts in your presentation, Yellowfin’s Storyboard gives you an interactive presentation using over 50 chart types and immersive analytics. This simplifies the process of visualizing, exploring and presenting data with no coding required. Yellowfin is a platform built for trust. It enables data preparation and enterprise governance to prevent inconsistencies adversely affecting the business. Connecting data is available from Big Data sources to relational databases and Web APIs. It also offers out-of-the-box best-practice apps using web connectors. Its data governance offers security, approvals, data preparation, admin console, and data quality, among others, to empower your business in finding and sharing insights quickly and with peace of mind as IT has complete security and governance of your BI environment. If you are considering Yellowfin it may also be a good idea to investigate other subcategories of Best Business Intelligence Software listed in our base of SaaS software reviews. Each organization has different requirements and needs a software that can be personalized for their size, kind of employees and customers, and the particular industry they are in. For these reasons, no platform can offer perfect functionality out-of-the-box. When you look for a software system, first be sure what you require it for. Read some Yellowfin reviews and ask yourself do you need basic tools or do you require sophisticated functionality? Are there any industry-specific functionalities that you are seeking? Find the answers to these questions to help your search. There are multiple factors that you need to reflect on and these include your finances, particular business requirements, your organization size, integration needs etc. Take your time, use a few free trials, and finally zero in on the app that presents all that you want to improve your firm competence and productivity. How Much Does Yellowfin Cost? We realize that when you make a decision to buy Business Intelligence Software it’s important not only to see how experts evaluate it in their reviews, but also to find out if the real people and companies that buy it are actually satisfied with the product. That’s why we’ve created our behavior-based Customer Satisfaction Algorithm™ that gathers customer reviews, comments and Yellowfin reviews across a wide range of social media sites. The data is then presented in an easy to digest form showing how many people had positive and negative experience with Yellowfin. With that information at hand you should be equipped to make an informed buying decision that you won’t regret. What are Yellowfin pricing details? What integrations are available for Yellowfin? If you need more information about Yellowfin or you simply have a question let us know what you need and we’ll forward your request directly to the vendor.